My name is Danny with RevLine Customs. First off, Great Forum. This is my first group buy on Audi Forums, but I hope it goes well. This group buy will end September 30th. All orders must be paid in full by Oct. 2nd. Dont Worry if you miss out on this one I will start another on Oct.1st. I want to run a new one every two weeks or every month I have not decided yet. If you have any quesions, or would like to suggest any product for next months group buy please PM me or email me at [email protected]. Also I have a group buy running in other places for door kits, but I know not many Audi enthusiasts do not like door kits on their Audi, nor do I. But if you are please contact me and I will set you up. Price do not include shipped. Shipping will be $150 and will be shipped freight, I will try to work on shipping prices depending on number of hoods we sell. 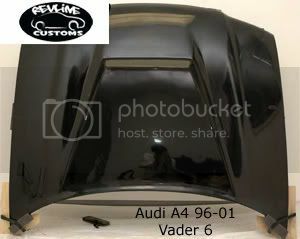 If you are looking for a hood, trunk, bumpers, etc. for your Audi, please contact me and I'll do what I can to add it to this Group Buy. Danny, anything for a B5 allroad in carbon fiber? Danny, anything for a B7 S4 in carbon fiber? Not at this Time, I'll keep you updated though!! It's been a couple months, but I'm new to this forum. 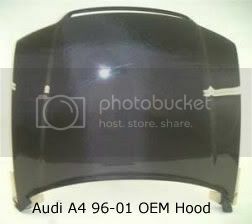 How much would it be to ship a B6 OEM CF hood to the UK? Postcode IP279DH, or to Stansted airport, near London? Or possibly Norwich? Also, do you have any better pics of the hoods and weave? I'm very interested, and if you could ship to my APO box on base, that would be great. But I know these are too big for that. 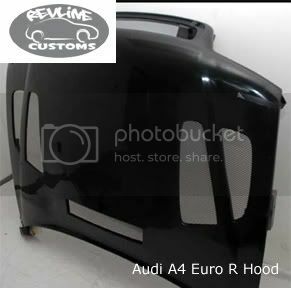 I am interested in the euro R hood in fiberglass, how much shipped to San Diego, 92128. Where are you located, if you are close could I possibly pick it up. DTM autohaus CARBON FIBER HOODS! !